The core recipe here is my Bacon Wrapped Pork Tenderloin with a Garlic Rosemary Rub. The main difference is using less garlic (don’t hate me) and adding smoked paprika. This rub, along with using a smoked bacon, gave an intense flavor that would have you thinking you cooked the entire pork tenderloin in an outdoor smoker. Something I’ve learned about wrapping the bacon so you avoid having to tie it down. Overlap each of the bacon strips about 20% as if they were connected end-to-end. Also, each time the bacon goes around the tenderloin, lay the new strip just a little on the old strip. This avoids the need to use butcher twine, poke with toothpicks, etc. I also found that the pork can be easy to dry out at a higher temperature, so I opted to sear the tenderloin first and then cook it at two temperatures. Sounds complicated, turns out great though. Start the pork in the oven preheated to 350 and then turn it up to 425 as soon as you put it in. I put a meat thermometer in and pulled the meat as soon as it hit 150 degrees, which was in about 26 minutes. 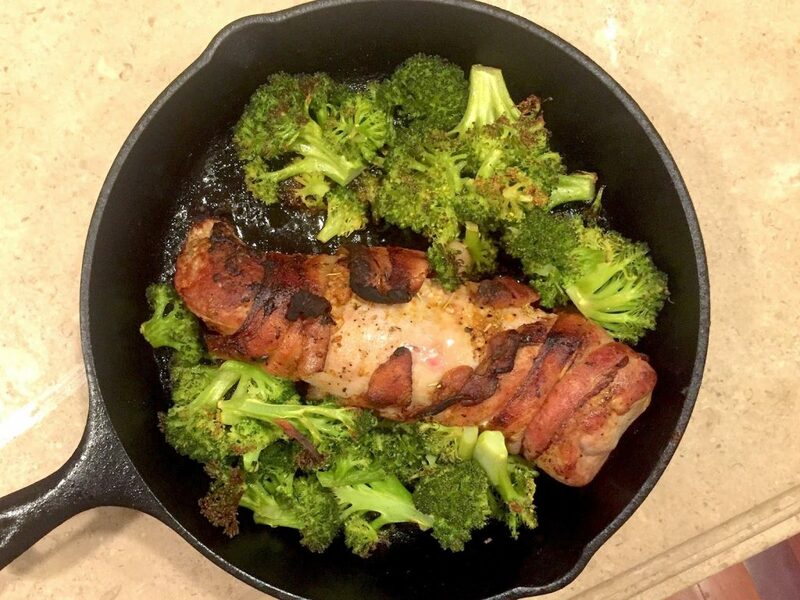 You don't need a smoker to make this delicious bacon wrapped pork tenderloin. Plus it all cooks in one cast iron pan. Halfway through, lightly stir around the vegetables so they cook evenly and don't burn. You may need to pull them out a few minutes before the pork is done.